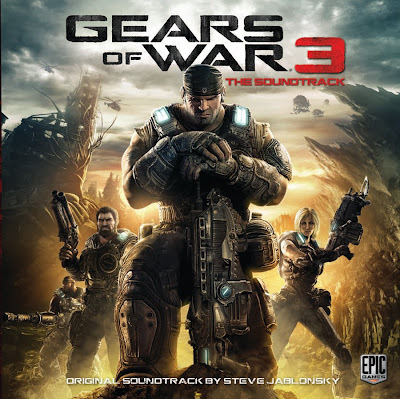 Home » epic games , gears of war , gears of war 3 , music , reviews , soundtrack , steve jablonsky , video games , xbox 360 » Review of Steve Jablonsky's GEARS OF WAR 3: THE SOUNDTRACK CD! Review of Steve Jablonsky's GEARS OF WAR 3: THE SOUNDTRACK CD! Ooh-boy, how am I going to handle this?! I mean, Gears of War 3 doesn't come out until September 20th, this coming Tuesday. And there ain't no way that I'm gonna get an advance copy of the game itself. Hey, I've got connections, sho 'nuff... but they don't penetrate into the inner sanctum of Epic Games (even if it is just a few miles away in Cary). But a package arrived in the mail this week: a copy of the CD of Gears of War 3: The Soundtrack, composed by Steve Jablonsky. Hmmmm. The score CD for the next Gears of War game. Composed by the dude who did the score for Gears of War 2, the Transformers movies and a bunch of other great stuff! Y'all think I'm not gonna review this bad boy?! The thing is, I can listen to this abundawonderful score all I want... as I already have! But until I play the game itself, there's nothing to put this music in context with. I've done reviews of Jablonsky's Transformers scores and posted a review of Gears of War 2: The Soundtrack three years ago. Okay so here's what I wound up doing. I set this CD a'playing and as each track ran, I composed my thoughts for it. So what you're about to see is something of a "running commentary" for the score. I'll preface that stream of consciousness by saying this: that Gears of War 3: The Soundtrack is already one of my favorite scores for any medium! This album easily represents Steve Jablonsky's finest work to date. His Gears of War 2 score was already one of the most-played on my iPod (it's terrific listening for when you're in the chair at the dentist's office) and for Gears of War 3, the man has ratcheted up his game to intense new heights of instrumental emotion. Jablonsky's work on the previous game garnered great acclaim and some awards... but what he has turned in for Gears of War 3 will arguably set a whole new standard for the art of video game music. This is legendary accompaniment for a legendary saga. Awright well, on with the tracks! 1. “Restless” – Some subdued strings building up to... something. Trailing off with a nice bit of piano. 2. “Gears Keep Turning” – This must be the “main” theme music of the game. The now-familiar Gears of War titles that Jablonsky so beautifully elaborated upon in Gears of War 2, given a drastically industrial tone. LOVE THIS TRACK!! 3. “Meanwhile Below Deck” – Lot of rising tension. About what, I haven’t a clue. Brief but wicked. 4. “Stalk City” – Having read all of Karen Traviss’ Gears of War novels (including Coalition’s End released last month) I’ve a pretty darned good idea what’s going on here. The Lambent are coming, people... and now we have proper music for it! 5. “High Seas Tension” – A bit sneaky and espionage-ish. Why am I thinking of Chairman Prescott when I listen to this? 7. “Marcus’ Rock” – More industrial with lots of heavy drums. Well, it’s a track named for a heavy guy, ain’t it? 8. “Calm before Chaos” – A quieter piece with underlying menace. 9. “Bridge Too Far Indeed” – Probably a track for an extended action sequence in the game with heaps of frantic. At 3:42 this is the longest track of the CD so far. 11. “Forever Omen” – One word has come to best describe the Gears of War saga in my mind as this story has progressed over the past five years: “desperation”. This track, more than anything else on the CD thus far, evokes that sense of dread and increasing hopelessness. A beautiful and provocative piece. 12. “Hanover’s Favorite Son” – Didn’t Augustus Cole play thrashball for Hanover? Seem to recall that from the books. So I’m thinking this track has to do with Cole. Starts off surprisingly quiet then uplifts to a very patriotic-sounding crescendo. Another beautiful piece! 13. “Fence House Suicide Pills” – Something terrible is happening alongside this track, and I could write that even if it had been named “Happy Little Squirrels Dancing”. 14. “Ghost Town” – This brings to mind the journey to Mount Kadar and into Nexus from Gears of War 2. Maybe the fight through the ruins of Landown as well. 15. “A Fine Mess” – Most likely something for another crucial battle scene. 16. “Loss of a Leader” – Some mournful segments throughout this piece. But as for which leader (and who or what he/she/it is a leader of) I can’t clearly tell, though there is a COG-ish suggestion to it. 17. “Deadland Dance” – At 5 minutes and 17 seconds this is the longest track of the Gears of War 3 score. Somewhat bifurcated around the 2:20 mark, make of that what you will. The second part is fraught with increasing tension. Love how Jablonsky has worked the Gears of War main theme into this (as he is doing with much of the score already). 18. “Creeping Dread” – This has me thinking of the very first time that I played the original Gears of War, that first level where Dom breaks Marcus out of the Slab. 19. “Hammer Meets Anvil” – The title of this track alone has me giddy! The Hammer of Dawn being used at Anvil Gate perhaps? Hey, I’m stoked simply about the fact that Anvil Gate is reportedly a location in the game! A hard, brooding and threatening piece ending with what could be a countdown chanted by the Locust Horde’s Kantu priests. 21. “Last Resort” – I have no idea what this is supposed to be music for. It’s beautiful, but... it could be set to anything. 22. “Full Circle” – Opens as if it’s written for a dramatic cutscene then quickly jumps to fast-paced action, before resolving into an even deeper and darkly brooding piece and ending with soft piano interlude. Something massively important is taking place here... I can feel it. 23. “Jumped Species Barrier” – That doesn’t sound good. If you’ve read the last two Gears of War novels, then you know that doesn’t sound good at all. This track echoes that. 24. “Ashes Fall Down” – The second-longest track of the CD (4:02). A wrathful piece of sound and fury. 25. “Fathoms Below” – If this is supposed to be “fathoms below” the surface of the ocean, there’s an awful lot of combat taking place down there. Or it could be fathoms below down in the Locust tunnels. 26. “Gasbag Airways” – Does this mean we’re gonna ride a torture barge again? Track continues the fast action pace of the previous few. 27. “Paradise Found” – There is a slightly alien sound to this track. Or at least exotic. And then it ramps up fast and crazy toward... what?!? 28. “Father and Son” – Another track whose title alone makes me eager with anticipation. Listening to it, I honestly can’t help but envision Marcus Fenix and his father Adam Fenix having their reunion. Gears of War has become a multi-generational epic on the same level as Star Wars and Harry Potter (not to mention The Godfather saga). This piece resonates that quality. 29. “Fury of the Tempest” – Stormy and apocalyptic. Full of rage. 30. “Live for Me” – A track of tragedy. Reminds me too much of “With Sympathy” from the Gears of War 2 score and if you played that game, you know what scene it was set to. Are we gonna cry just as when we get to this part of Gears of War 3? But no time to be tearful ‘cuz then it finishes on an action-suggestive tone. 31. “Finally a Tomorrow” - WOW!! The chorals alone set this track apart from darn nearly anything else we’ve heard from a Gears of War game. Could it be? Dare we hope that… there really will be a happy ending to this story after all?! Jablonsky is evoking an optimism that we just haven’t heard at ALL in this series. This is the flip side of the coin from the sinking of Jacinto at the end of Gears of War 2. And it sounds stunning! Gears of War 3: The Soundtrack by Steve Jablonsky is published by Sumthing Else Music Works, and will be available on September 20th from Amazon.com and other fine retailers. But if you just can't wait, you'll be pleased to know that it's already available via Apple's iTunes Store! So you can buy it now and buy it next week too (hey, I wound up getting it from iTunes as well as the nice shiny physical media currently and legally in my grubby lil' paws). However it is that you buy it, Gears of War 3: The Soundtrack gets this blogger's highest recommendation! Go get it. Or perish in flame. It's your choice. But, not really.